250 pages | 1 B/W Illus. 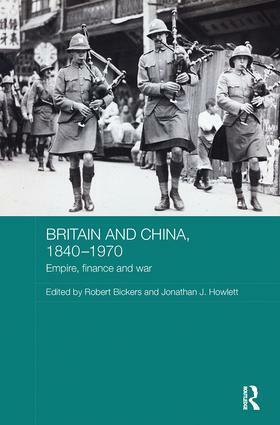 This book presents a range of new research on British-Chinese relations in the period from Britain’s first imperial intervention in China up to the 1960s. Topics covered include economic issues such as fi nance, investment and Chinese labour in British territories, questions of perceptions on both sides, such as British worries about, and exaggeration of, the ‘China threat’, including to India, and British aggression towards, and eventual withdrawal from, China. Hirata, Howlett, Jackson and Chen)." Robert Bickers is Professor of History at the University of Bristol, UK. Jonathan J. Howlett is a Lecturer in Modern Asian History at the University of York, UK.